Edward Snowden is important because he added some detail and put a spotlight on a truth this blog has been documenting for some time. That truth is this . . . The U.S. government today is in possession of technology that tyrants of yesteryear would have salivated over. This technology is quickly turning America into an electronic prison from which escape to freedom is nearly impossible (because the alternatives to America aren’t so good either). 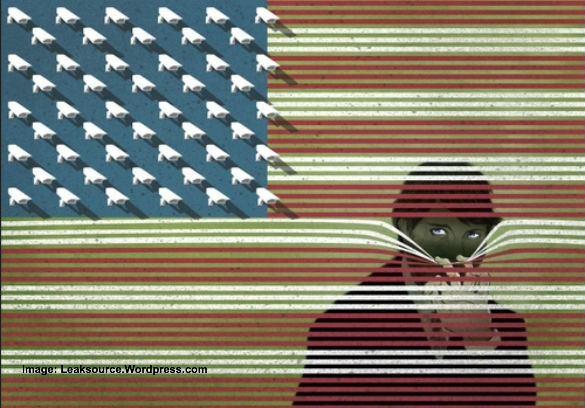 The U.S. government now tracks, monitors, records, and stores most of your activities and communications. You have no privacy anymore. This means you must be very careful what you say, even what to think . . . because whatever you say, write, or even think can (and probably will) be used against you. This is the society in which we now live. We are no longer a free people. Yes, we can live a comfortable life. We can go to work everyday and collect our paychecks. We can watch our TV shows at night and attend sporting events. The government will even allow a certain amount of criticism of the government. But that doesn’t mean you are free. Information is power. Information is the most powerful weapon on the planet. That’s why blackmail is so effective. Now your government knows everything there is to know about you — or can instantly access this information, as needed to serve its purposes. The government can use this information to destroy you at any moment, whenever it pleases. Because there are so many laws and regulations on the books, I have been told by federal prosecutors that the government can convict anyone of a crime if it focuses on someone long enough, searches hard enough through all your records and communications. Now we have computers that can conduct investigations of all of us at lightening speed, with sophisticated algorithms. Experts say Google is rapidly approaching the point when it will be able to predict whether you are about to commit a crime (just like in the Spielberg movie Minority Report – which had people arrested and convicted before they actually committed the crime). The Supreme Court has repeatedly ruled throughout America’s history that police cannot conduct dragnets that sweep up innocent citizens in an effort to find criminals. Nor can police or the government rummage through your garbage or personal correspondence to find evidence of a crime without “probable cause” and without a warrant from a court. Warrants can only be issued if there’s evidence that the specific person in question has committed a specific crime. The argument for a warrant must include specific items and evidence police are searching for. In other words, the bar is supposed to be high for the government to be able to rummage through our lives and things. Clearly, there’s no bar at all anymore. The government now treats the Constitution and Supreme Court rulings as advisory, at best. The government can (and is pretty much is) doing whatever it wants to us. We once thought the Internet and all this technology would be a force for liberation across the globe. But instead, this technology is quickly turning into a weapon to make our enslavement by government (in cohoots with mega multinational corporations such as Google, Yahoo, Microsoft, Apple, Facebook, etc) easier and more efficient than ever. FACT #1: Everything Edward Snowden has told us about NSA’s spy program on Americans has proven to be accurate. Actually, the situation is substantially more alarming than what Snowden told us. We now know the NSA is collecting and storing pretty much . . . FACT #2: Edward Snowden reports that the NSA has the ability to track what we are thinking in real time as we are typing on our computer keyboards. FACT #3: We now know the NSA has the authority to access any of this information on any individual it chooses without a court order “simply based on an analyst deciding that,” according Rep Jerrold Nadler’s (D-NY) account of an intelligence briefing he received. “I was rather startled” to learn this, Nadler said. FACT #4: There is no time-limit for how long the NSA can keep all this information on law-abiding American citizens. NSA readily admits it plans to keep all this data on every law-abiding American forever. FACT #5: The NSA is collecting 2.1 million gigabytes of data on all of us every hour. FACT #6: Overall, Republicans are worse than Democrats on this issue. In a vote in the U.S. House of Representatives, 134 Republicans and 83 Democrats voted against putting even modest limits on the NSA’s spying activities on law-abiding Americans. FACT #7: Republican leaders such as Sen John McCain, Gov Chris Christie, and Congressman Peter King are calling other Republicans, such as Sens Rand Paul and Ted Cruz, “crazy” and “dangerous” for raising concerns about the NSA’s comprehensive spying on the daily activities of every American. FACT #8: According to NSA whistleblower William Binney, the NSA has a “target list” of somewhere between “500,000 to a million people“. FACT #9: The NSA is just one of 17 U.S. spy agencies, each with similar data collection programs, all operating in a shroud of secrecy with secret budgets that together total about $80 billion annually. FACT #10: America is supposed to be a government “of the people, by the people, and for the people ” — but there is no way for voters to hold these spy agencies accountable because we have almost no idea what they are really doing. FACT #11: But even if most of America’s “low information” voters knew what was happening, it’s unlikely anything would change. Surveys show most Americans support the NSA’s comprehensive spying on every aspect of our lives. In other words, most Americans today have no problem with putting themselves in this electronic prison and throwing away the key. Tomorrow, Part 2: Obamacare is a Surveillance State Horror.